Ownership / Access: Municipality of Charleroi. Notes: Château Bilquin de Cartier (French: Château Bilquin de Cartier) is a château in Marchienne-au-Pont, a part of Charleroi, in the province of Hainaut, Belgium.Origins of the château can be traced back to the 17th century, around 1635, when the Honoré family builds a castle on the Sambre river bank. The place had formerly been occupied by a seigneurial manor which was dertroyed on 21 July 1554. In 1667, the unfinished Spanish fortress of Charleroy is captured by Louis XIV's troops during the War of Devolution. 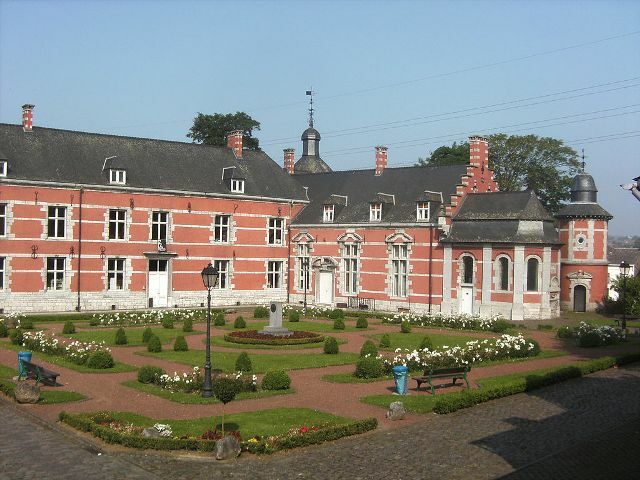 As the castle in Marchienne was located in neutral territory (under authority of the Prince-Bishopric of Liège), it was used as a hospital for both French and Spanish soldiers. The castle today hosts a public library on the ground floor (Bibliothèque Marguerite Yourcenar), and administrative services of the Walloon region on the first floor. The library has a section dedicated to books in Turkish language. The courtyard is equipped with benches and is publicly accessible as part of the Marchienne-au-Pont municipal park. The castle wing which was located on the southern side of the courtyard has been demolished to create an entrance for the De Cartier station of the Charleroi metro. At the tip of the western wing, a stone porch is adorned with the arms of the Bilquin-Baillencourt family, and a 1699 date inscription. Similarly, the lintel above the northern wing door shows a scalloped key with the arms of the Cartier family. Other demolished features include a barnyard where the Marchienne-au-Pont municipal swimming pool now stands. A 19th century grain elevator in neo-renaissance style can be seen on the Sambre embankment.